Bugs was in there with Sylvester.....Easter wallhanging? start of another bag........these are addictive.a gal can't have too many bags can she? Is that how "bag ladies" are born? made a baby bib- the only project I "finished". I have been busy but not many finishes. Just more UFOs. ha ha But I am on the right track using up the fabric. You won't believe what you will find in the dark corners of your stash! Who knew? Yesterday hoed half of the garden. I picked some Kale and put it in the freezer for later. kale soup is a staple at our house in the winter. YUM! and good for you too. everything is growing good. Hopefully no rain in sight to keep the weeds down a little. Been hoeing a lot to keep them at bay.Dad has been coming down and hoeing like crazy. He lives about 20 minutes away but loves the garden. You can't take the farmer out of him. Our garden is a field. It is huge but we freeze and can the excess to have homegrown veggies in the winter. Can't wait for the first tomato. Even though I have "officially" harvested something, it doesn't count until the first tomato is picked! anyone else live on tomato sandwiches in the summer? oooooooo that is living! so far have not seen the raccoons this year but saw the biggest fattest woodchuck run from our field to the farmers field across the road. He will be trouble when the butternut squash starts to grow. I shook my fist at him and yelled "that's rig! go to his garden~ it is much bigger!" LOL I don't think he was afraid. A fox has been a little troubling. He was up on our front porch one day and the next day in the neighbor's yard. Nothing here like chickens for him to eat so not sure why he is sticking around. They eat little animals like chicks, eggs,birds,baby bunnies and chipmunks. We will have to keep an eye out for him just to make sure he is not rabid or something. I think he is just surveying the area for possible places to make a den. We do feed feral cats and the birds so hope we are not "setting the table" for the fox. Not much happening here except work today. watching the grandkids tomorrow play baseball and Wed learning our fate at work. We have been bought out by another company and are supposed to know Wed how much longer we have a job. YAY.....just love this economy and how companies buy other companies until they are the only one in town. makes me sick. Money rules and it should not. hopefully Wed is not our last day! their computer conversion is not done yet so I think they still "need us" for a bit.you just never know. would you continue to play in the scrap bin? or quilt this for Dunkin? or finish up the runner? or border this baby quilt? or work on trimming and quilting this baby quilt????? I need to make a decision and go for it! Unfortunately this is the tip of the iceburg.........but a little at a time as long as I am plugging away, right? help me pick what I should do. How can this little guy on the right be old enough to go into Jr high? This Friday he will graduate from his school and next year be in Jr High. It doesnt seem possible. this picture was only taken a short time ago or was it???? They grow up too too fast! Congratulations to all the students everywhere who worked hard and are graduating from elementary, Jr High, high school and college. Education is important! Great job! I played with some scraps and tried to sew fabric "15 minutes" style of Victoria. see her link on the side of my blog. It is a fun process. I just grabbed "like" colors and don't know where this is headed. I just thought I would try out the process and see what it becomes. Maybe a rainbow quilt with each block having a particular color? Not sure. I want to do the color challenge she has out there but there are too many things to finish up first. Gotta get organized and get things done around here. Then I will have some portable handwork for applique, quilting etc. Dunkin it seems has picked out his quilt. it is one of scraps that I sewed onto a muslin square base. This small quilt used a ton of scraps but I think they grow overnight because there are still more in the zippy bag! what do you think Dunkin likes about this quilt? is it the eyes looking at him playfully? is it the dog noses? the feeling of ha ha I am a cat and I rule over you Mr Dog? Is he dreaming of Santa and snowmen? and making his list? Or does he just want to claim it because it is there? this is the side view showing the dresses and denim ruffled skirt in the back. so so fun! Tell me this girl is not spoiled! LOL She just snuggles up and parks herself wherever she wants to. I need to make Dunkin's quilt next. I have some scraps I sewed together that need to be sewn into the top. 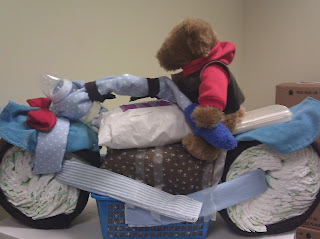 A few more pieces need to be added and then I can quilt it up for him. I would like him to have his very own soon. Daddy likes the AC a little too much! so I freeze and the two "kids" Phoebe and Dunkin will snuggle on their quilts. they fight now for the one quilt to see who gets it for the moment. The diaper cake came out so so cute! I will deliver it today. hope she likes it! pictures soon. It is only 5am so I guess I have some time to play in the fabric scraps. see you later hopefully with some progress. Today is my Friday. Woot woot! I took tomorrow off as a vacation day. That will hopefully allow me to catch up with things. I have no garden pics but we have lots of food planted.tomatoes, beets, watermelon, cantaloupe, butternut squash, zuchinni, summer squash,red onions,cucumbers,sweet bell peppers, hot peppers,corn. I think I covered it all. Biggest two challenges......WEEDS and RACCOONS EATING THE CORN. If anyone has any ideas on how to deter the raccoons we are willing to try just about anything. Last year in the early morning I saw a family of four going through and knocking down every stalk to eat a little piece of an ear. We got hardly anything out of 4 long rows. Such a shame! I don't mind them eating a little but they are wasteful little critters and don't finish everything on their plates! Remember the one that you "stole"? We were making lap quilts one Christmas for the nursing home and every time Mom put this one in the box you claimed it with your fur. She would take it out, rewash it and put it back only to have you do that again and again. The third time Mom gave in and said "Ok, it is YOURS". see here is the front and back..... a pretty pink and green and blue pattern called Lovers knot. Here it just looks kind of like a zig zag. MY QUILT IS NEXT........YOU ALREADY HAVE ONE!!!!!!! YEAH WHATEVER Dunkin! This afgahan is MINE too! so buzz off! I was here before YOU were! Here is what I have been working on. A dresdan runner...... I need to figure out what color for the circle in the center. I only have pieces of the pink and the blue in the stripes section. None of the green. I think the pink but then I am thinking the blue. ideas? maybe something totally different? The muslin? I am thinking of adding strips the width of the ones in the side blocks as a border, then quilting it. again I am torn between the pink and the blue. quilty friends, help!